This is the story of how me and some other bloggers met the CEO of Funimation at Comic Con, and then some. The main characters in this story. Daniella, who I worked with earlier this year to help the relief efforts in Japan, and I had to stay close to each other much of the time, during that strange JManga.com reception: it was hard to get a word in to a lot of the people there since we were among the few who didn’t speak Japanese. We were in a room full of Japanese executives, whom Chase Wang—he of former AX and now AM2 fame—had invited a bunch of us bloggers to meet after the JManga.com announcement at Comic Con. There were translators, writers, and even a few other bloggers eagerly speaking to representatives from Shueisha, Kadokawa, and the other publishing conglomerates who were combining to launch this online manga reading service. And we couldn’t talk to any of them directly, even though we had questions that weren’t answered during the panel. “Maybe we should find a translator for us,” Daniella said. “But who?” I wondered aloud. The few translators I knew by name seemed already busy, immersed deep in conversations with only a few words I could pick out from years of anime watching. A decade of anime watching does not constitute a linguistic education: you don’t really absorb a language by osmosis by watching subtitles all the time. I hovered around the table of hors d’oeuvres, occasionally grabbing some crunchy rolls (harhar) and sliders, hopefully not enough to look gluttonous. I was going to use this reception, which was held at Roy’s Restaurant, as dinner. Another journalist approached me while I was standing idly by the food. Stephen of The-O Network was also another non Nihongo speaker stranded, seemingly, in this crowd of insiders and wannabe insiders. We introduced ourselves and soon started talking about our common dilemmas, and soon it was the three of us standing in the corner after the brief presentation, wondering how we were going to overcome our awkward nervousness and try to approach some of these people. 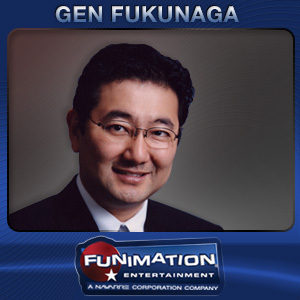 I remember feeling surprised that one of the people who spoke was none other than Gen Fukunaga, the CEO of Funimation—an anime, not a manga distributor. 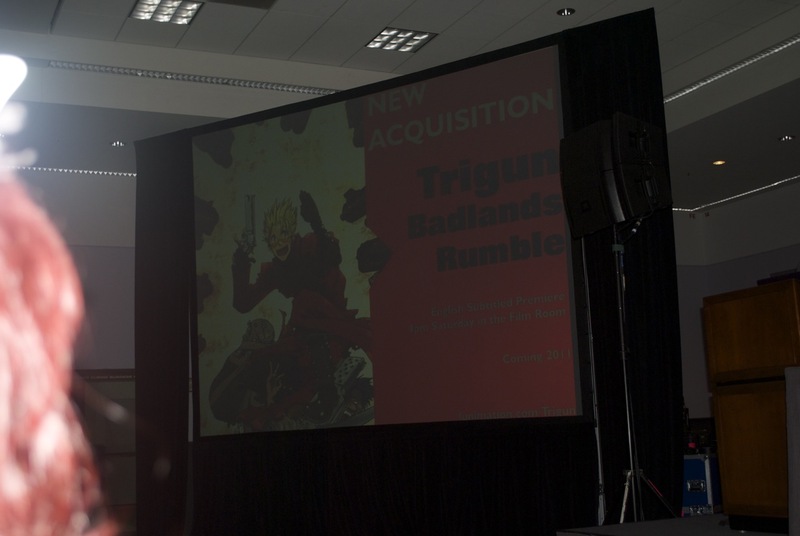 Fukunaga had made some general comments about how Funimation would be lending some cross-promotional support to various JManga titles, if they happened to have any anime versions of the manga being sold. Fukunaga was Japanese-American, meaning he spoke perfect English. He also seemed more outgoing and approachable than the more formal Japanese executives. Cultural stereotypes in action, I suppose. What got into me to flag Fukunaga down, then, when I saw him pass the three of us by, I don’t know. I remember seeing Deb Aoki in the back talking to another executive, tape recorder in hand, and I was thinking to myself that I probably should be doing the same thing and how I wished I could do it too…but Fukunaga saw me wave, and he eagerly came to the three of us to introduce himself. 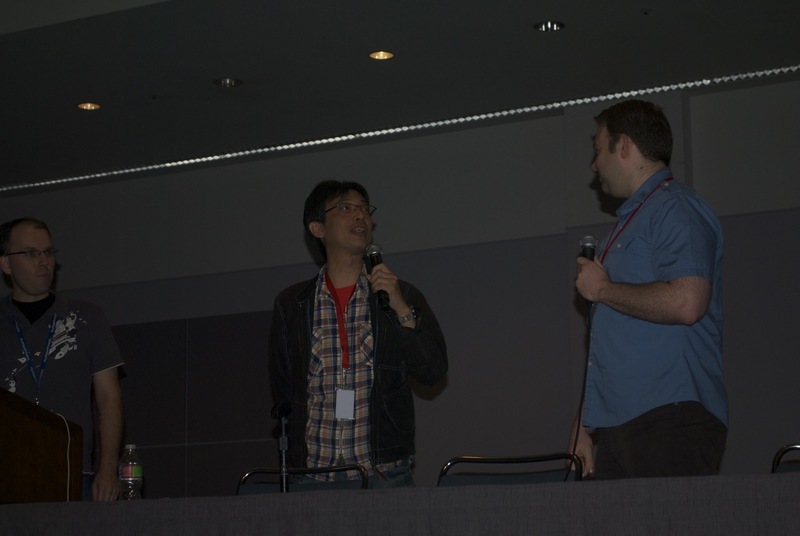 Immediately, we took the opportunity to pepper him with questions: about Funi’s streaming plans, about what they were even doing at JManga.com’s reception. He answered more than thoroughly: he seemed eager to explain himself. About how more streaming options were coming soon, about how he foresaw the problems that both the manga and anime industry years ago, and that they were busy trying to reach new audiences. He then proceeded to ask us for our opinions about how they could make crossover animations using Western game properties like Dragon Age and Mass Effect. We did not hesitate to give our opinions. Fukunaga also told us some information which he said should remain off the record. All I will say is that they will become competitive very soon in a burgeoning field, and that some long-awaited wishes will be granted. I remember I felt that finally, the reception hadn’t been a waste. Daniella and I then rushed out to head to our next panel, the Yen Press presentation—I was committed to liveblogging as much as I could that was manga-related at Comic Con—and we were both kind of marveling at how easy it was to talk to a CEO, one that controlled the majority of the domestic anime distribution market to boot. I was impressed, certainly, with his openness, something that Funimation has improved on over the years. Finding him was certainly a surprise, and a sort of surprise you wish happened more often at conventions. Jeremy called me while we were walking back into the convention center. He had exciting news to share: he had managed to secure an interview (which you can see here) with the CEO of Nico Nico’s American branch, James Spahn. 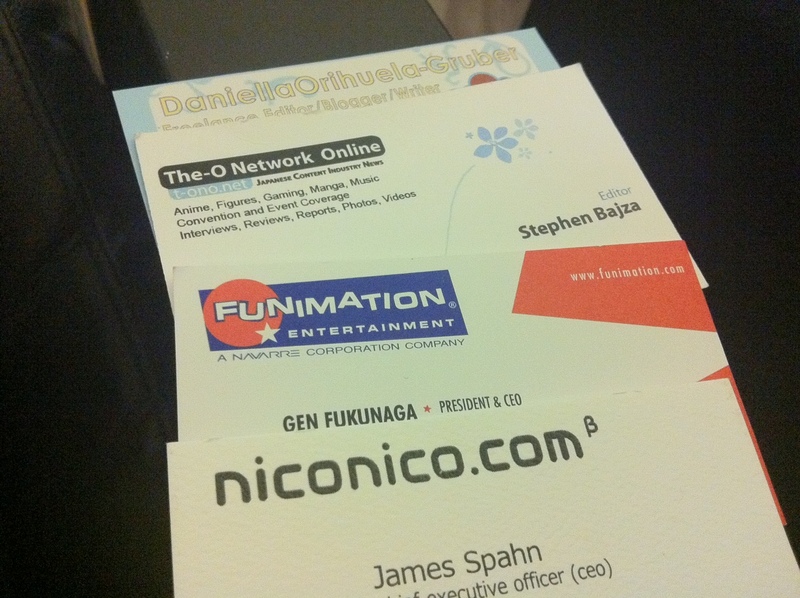 Apparently my contact with Fukunaga—Nico Nico and Funimation are partners—was rather serendipitous. Suddenly, we had an entry point into both Nico Nico and Funi, big players in our corner of the world, and this could be a potentially fruitful partnership. I remember going to the Funimation booth once, because I had to inform Mr. Spahn that we had to postpone our interview by a day. He was talking to someone else, while the Nico Nico guys were filming cosplayers and interviewing them just behind. You could see the trademark scrolling comments rolling by on the screen. I patiently waited for him, before realizing it would be a while before he finished. I always feel awkward in these situations: I wandered around the booth, looking at the DVDs and Blu-Rays for sale, weaving through the crowds of cosplayers who were trying to make it onto Nico Nico. I didn’t want to be the creep who hung around the edges, anticipating an opening; but, I had an important message to convey. It took a good while before he was free and I managed to deliver my message. The interview itself was much more like a conversation. Jeremy had already started talking to him once I arrived, my voice memo recorder app in hand on my iPhone. The recording actually started a bit late, but we got enough good quotes down for an article. Next and final part: comrades and colleagues in the blogosphere. Upon my first notice of American fandom’s response to the web-comic sensation, turned anime hit, Hetalia Axis Powers with masses of cosplay groups devoted fans, already I was under the impression that this was a series that spoke to a very specific contingent of fandom. Sadly so, I was right. The animated version of Hidekaz Himaruya‘s megapopular WWII-era allegorical comedy speaks less like a pointed satire of world affairs, and more of an aimless fluff piece for the fujoshi-esque. Helmed by Bob Shirohata of Gravitation fame, I suppose this should’ve been a no-brainer, but even if Himaruya’s knowledge of the events leading to the second World War are sound, there plain just isn’t enough here to substantiate a TV series. In a grandiosely broad universe of anthropomorphic representations of the world’s nations, we bear witness to the days in which peaks of civilization borne from the leaps of Roman innovation, leading to the fateful meeting between ever burly/ramrod straight, Germany..& hopelessly aloof childman, Italy. No sooner does this happen, that petty fights have been overflowing on both sides of the globe, including the quiet, industrious little giant, Japan, and later America, have been reaching a boiling point. Now if only Italy could grow past innocent flirting with whoever crosses his path, with dreams of cuteness & pasta. It is in this chance encounter that the madness of Hetalia makes itself something of a minor phenomenon in it’s native country. With tall, blonde rulemonger strongman, Germany constantly in the role of would be great leader reduced often to babysitter, and Japan as the unwilling, stoic accomplice, are among the larger running gags that fuels much of the series. Now while a part of me had a feeling that this was indeed a fan contingent that I had little in common with, I found it important to see exactly what it was that made the comedy work so well with Western viewers. And to be honest, after several episodes, I still am at a loss to understand it. There’s no pretending here of what this show is aimed for, and perhaps it comes required to come in with a certain attitude. From my view it’s like this; if you enjoy a growing bevy of attractive young men of varying archetypical dispositions & grossly generalized stereotypes in under five minute bursts of one-joke humor, then this show may be just what you’re looking for. And upon closer inspection, this series is another attempt to cash in on the success of a 4-koma style project. Problem is, that taken in the five minute format, the humor is so slight, and the animation so predictably in line with so many other bishi comedies over the last decade, that in the end, the series offers even less value in animated form than it perhaps does in panel form. 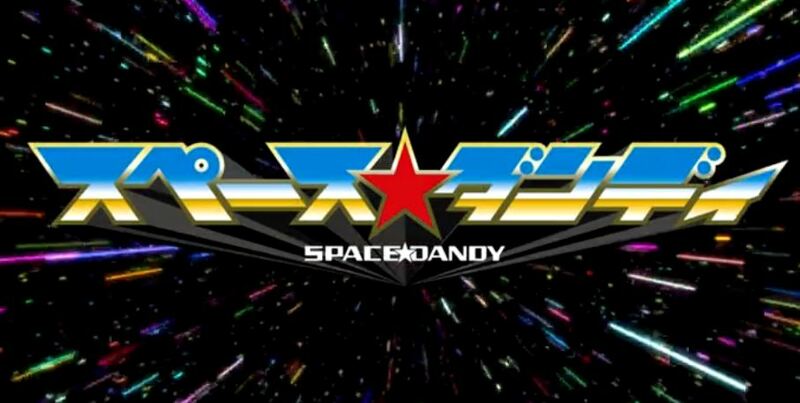 Point being, for the near hours worth of programming I sacrificed to this show, I could count the number of times I actually laughed….on one hand. Not a good sign for what is obviously meant to be comedy. It’s a shame, since a lot of potential feels wasted by this, the beginning of what many already know has become a multi-season affair. And again, this could very well be that my own take on World History runs counter to much of what many books often fog up rather than clarify. And bringing such events into such a format begs for something more akin to an actual sprawling narrative, something a 4-koma has little room for. And as a result, the shortened format works against much of the comedic possibilities, as well as my own patience. Oh, sure, we’ve had a fair share of these shows before, but many came in with a full understanding of the format. And unfortunately for Hetalia, it is a case of biting of more than the provided maw can chew. And then on the other side of the pretty people river, comes Studio Daume’s TV version of Fuyumi Ono‘s vampire mystery, SHIKI that while on paper seems intriguing, but in belated (the original novel is well over a decade old) anime form, suffers from a myriad of stumbling blocks, again namely in execution. The largely unseen village of Sotoba, a town more famous for the creation of burial stones & farmland than anything else becomes a surreal, isolated setting for some old school gothic horror when a bizarre family moves up the hill. Starting off the mysteries include the strange chain deaths of locals in neighboring towns, leading to the tale of young dreamer Megumi, who’s distaste of her quiet cow town leads her toward the exotic new folks moving into the european-style castle up the hill. Never one to listen to her elders, or ignore her wishes for a life more dreamlike & fulfilling, Megumi’s life soon spirals into the ever deepening conundrums regarding these newcomers who roam nocturnally, and remain eternally youthful. Caught in the maelstrom of questions regarding the strange crimes include newly transplanted recluse, Yuki Katsuno, as well as local doctor, Ozaki & inquisitive priest Muroi, as they are slowly enveloped by a creeping dread that these deaths aren’t the work of some airborne infection. No mystery here, and yet the atmosphere comes at you from frame one. The disconnect between these polar opposite feelings is at the heart of the problems that burden this vision of Ono’s popular book. For as at times beautiful as the imagery can be (from lush valleys of green, surrounded by seemingly endless arrays of mountains, to some truly chilling animated bursts), there are far too many elements of the absurd that punctuate matters with a lack of subtlety more fitting of a campy live-action art film. Somehow, when one mixes would-be EGL cuties lacking the wit to avoid the creepy castle up the hill, one becomes cloudy as to whether we are to buy into the horror, or just laugh at its absurdity. The central characters, for all of their posturing seem to lack any common sense, which does little to help matters as the body count begins mounting. And it is here, where perhaps this again reaches into realms of taste in regards to horror execution. When dealing with a mystery involving a body count, it is vital to ground us with those looking to solve the mystery. But when the show attempts to dazzle, and ignore the characters beyond mere type, the package becomes a blurry bore. If the rest of the series’ world had embraced itself as fundamentally not ours, and perhaps had some fun with the proceedings, then maybe excitement could have have been mined from this project, but as it stands, the disconnect is huge as we are expected to take the village’s illogically slow comprehension of events as reasonable. It isn’t, and as such, the series seems to want the cake of kitsch, as well as the bloody cherry cheesecake for dinner. It’s this greedy angle that in many ways hurts the show beyond a cult audience. While it must be looking to satisfy fringe fans of gothic horror, SHIKI does little to ingratiate itself beyond mere aesthetics (the hairdos & the stunt casting of pop conundrum, Gackt should be enough of a clue), which is a mild tragedy since it seems to have all the literary cards necessary to create a work that functions beyond mere novelty. I’d totally be down for some truly serious anime horror these days, so I guess it’s time to keep shopping the old school. Both Hetalia: Axis Powers & Shiki can be seen on Hulu courtesy of Funimation! 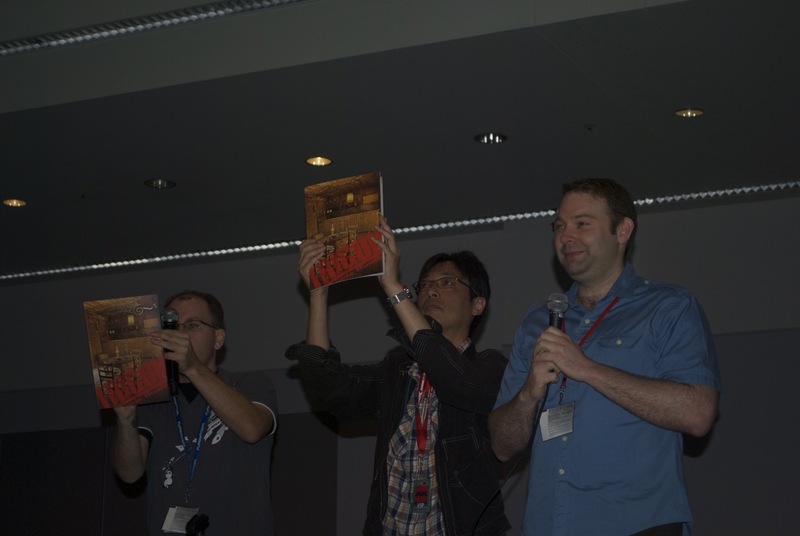 See our last panel report from AX and the licensing bonanza. 6:01 PM – Funi and the anime industry: it’s not as bad as it looks. The bad economy is a big factor. 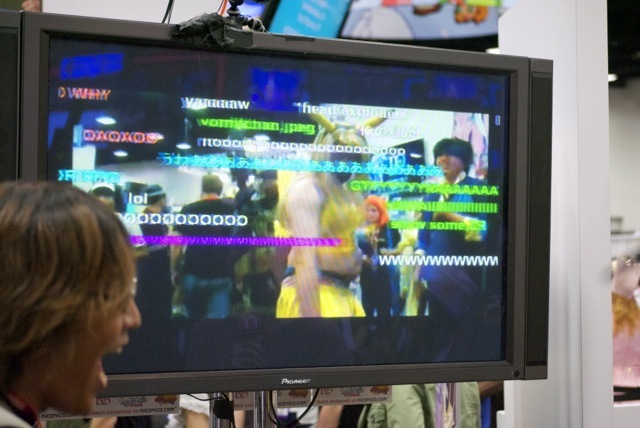 After all, AX was huge…recall the “DON’T PANIC” theme from 2008. They are committed to continunig dubs. 6:04 PM – 51% of the anime audience is older than 25. But the biggest group online is 13-17 years old. 6:06 PM – Social media strategy on Twitter, Facebook, Youtube, etc. Stats. 6:07 PM – Simulcasting. Including this season’s stuff. See their page. Also their Video on Demand from various cable providers. 6:09 PM – Antipiracy efforts. Just one lawyer and three staff? They go after the counterfeit goods, torrent links, streaming/download, direct link storage sites. Simulcasting. 6:10 PM – My Bride is a Mermaid (aka Seto no Hamayome). Trailer. I loved this show. 6:15 PM – Casshern Sins. 6:16 PM – Corpse Princess (Shikabane-hime), which they had been streaming for a while. Finally coming to DVD release. Great for the zombie fans! 6:18 PM – Hetalia Axis Powers (to much squeeing). Finally coming out on September 14th on DVD. I always thought this show was an excuse to indulge as much national stereotyping as possible :) They’re streaming it now. And that’s right–they hired their dub cast recently. 6:23 PM – Eden of the East (which I love dearly). Described as “Jason Bourne, the anime”–well, there are some similarities and one direct reference…See our interview with the creators here. Blu-Ray in September 25th. The dub voice for Juiz is actually pretty good. 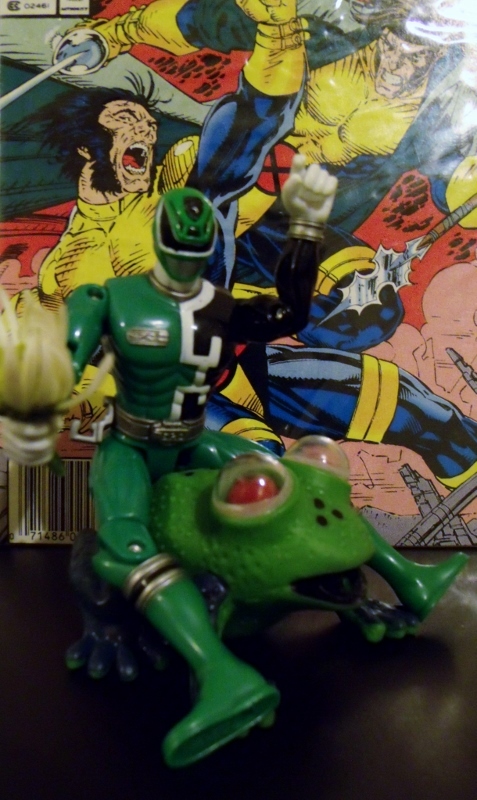 6;25 PM – Contest winner for the “Fullmetal Free Ride” video contest. It’s to show how big of a FMA: Brotherhood fan you are. They’re bringing the winner, Megan Hewlett, up to show the video. Funi apparently taped the reaction shot of them telling them they won. 6:32 PM – Alien vs Ninja from Sushi Typhoon, their live action Japanese cult film imprint. Also includes Mutant Girls Squad. They’re introducing the Japanese producer of these movies. They have a panel later tonight at 8:15 PM, with full screenings tomorrow night. 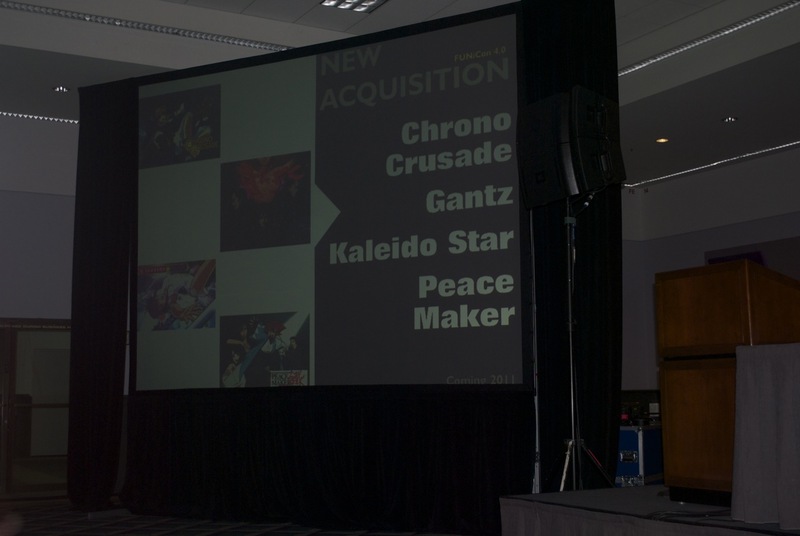 6:37 PM – AX Announcements: Geneon rescues: Technolyze, Ai Yori Aoshi, Armitage III, Haibane Renmei, Hellsing TV, Serial Experiments: Lain, the entire Tenchi franchise. 6:38 PM – Darker than Black s2. Shana S2. Railgun and Index. Black Lagoon OVA. Hellsing Ultimate V-VII. Trigun movie. 6:41 PM – Q&A section. That’ll be it for me today. The whole principle is wrong; it’s like demanding that grown men live on skim milk because the baby can’t eat steak. Fans raged on twitter and IRC channels today as FUNimation announced that Dance in the Vampire Bund DVDs would be released censored. Ordinarily, broadcast versions of risque anime are censored, and DVD versions contain the full content as an extra enticement for fans to purchase the DVDs. In an age of increasing backlash against the sexualization of minors, however, FUNimation may be feeling the pressure to conform to Western social norms. After viewing the unedited as well as the Japanese broadcast edit of the series Dance in the Vampire Bund, we have determined the series contains controversial elements which, when taken out of context, could be objectionable to some audiences. With this in mind and with approval of the licensor, we will edit select scenes from the series in streaming and home entertainment release. These are scenes which are inappropriate for U.S. viewing and are not essential to the storyline. Ray’s Take: hey you know, someone’s doing well. Quit moaning and see if lessons can be learned from their model. Krauser III’s Take: It was I orchestrating things behind the scenes and converted many! You are suprised that I care about DBZ, yes? Mwa ha ha ha ha ha! Oct. 1st, Tokyo, Japan. Our sources have indicated that 3 of the biggest animation conglomerates have somehow contacted the right people in the National Security Department and shockingly, they have somehow reached Aramaki, the section chief of Section 9, in order to help them to crack down on raw uploaders in Tokyo. As incredible and improbable as this is, it seems like somehow the National Security Section 9 has been monitoring the progress of fansubs for the past 10 years and our sources indicated that they’re not quite pleased with the way Section 9 has been portrayed. It has been rumored that the government has been secretly keeping tabs on raw uploaders in Tokyo and other big cities. Also, recently the government has been tightening up their censoring and cracking down of illegal anime and manga related activities, including selling doujinshi outside Comiket and other conventions. Our agency has received an instant message with a video attached. The message simply stated that: “Right Wing imperialism similar to Meiji Restoration is on the rise again. The electing of Fukuda instead of Aso is a ruse simply to lower the guards of Japan’s neighbors including China and Korea, and the United States of America. The rather puzzling video displays footages of a young Japanese man wearing a high school uniform with glasses and surrounded by women of different races and hair colors, wearing different culturally specific outfits, including a US colonial-style blouse, a German beer maid outfit, and a Chinese Dress, walking on a non-descriptive Japanese high school campus with falling Cherry Blossom flower petals in the background. The message ended abruptly there. Our agency is still trying to determine the meaning of this message and the attached video. But what is certain is that the (Imperial) Japanese government is on the move, with American and Japanese corporate cooperation. Of course, we are not ruling out the possibility that this could be a prank by the cosplayers in the States.